I feel terrible for posting such horrible photos of this No Bake Strawberry Milk Cheesecake on the blog, but the truth is I made this cheesecake 2-3 times already and every time it was devoured before I could get a decent photo. 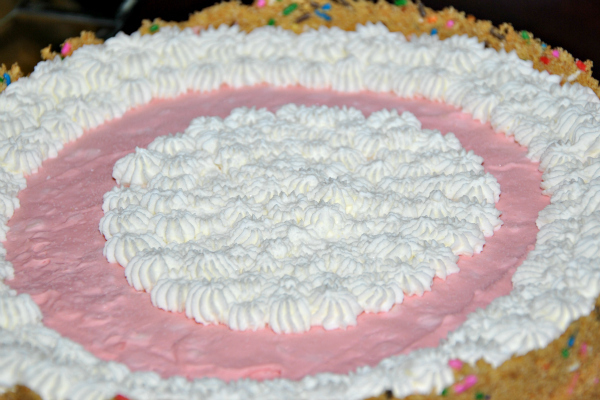 Cheesecake, strawberry milk, jimmy sprinkles, AND fresh whipped cream...I mean could you add anything else to this cake to make it any more delicious? When I stumbled upon this recipe on SprinkleBakes.com (print recipe here) it instantly took me back to my childhood days when I would beg my mom to buy me a container of Nestle's Strawberry Quick. I would then insist on drinking glass after glass because it was so good. So when I saw that this recipe had strawberry milk in it I knew I had to try it immediately and boy was my family was glad I did. It's fairly easy to make but a little time consuming since you have to make 3 separate components. In the end it is 110% worth the time and effort you put into the cake. 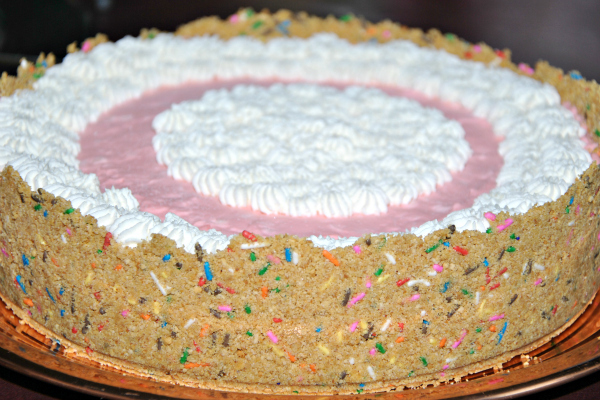 I do have a few suggestions if you do decide to make this No Bake Strawberry Milk Cheesecake (recipe here). 1. Do not add the salt to the crust. I used unsalted better and the added salt was too much and took away from the cheesecake. 2. Who doesn't love fresh whipped cream? Don't throw it out- go nuts like I did and add more to than top than you think you should. You're family and friends will love you for it. 3. Remove from the freezer 1-2 hours before eating then store in the freezer afterwards...of course that is if there is any left. 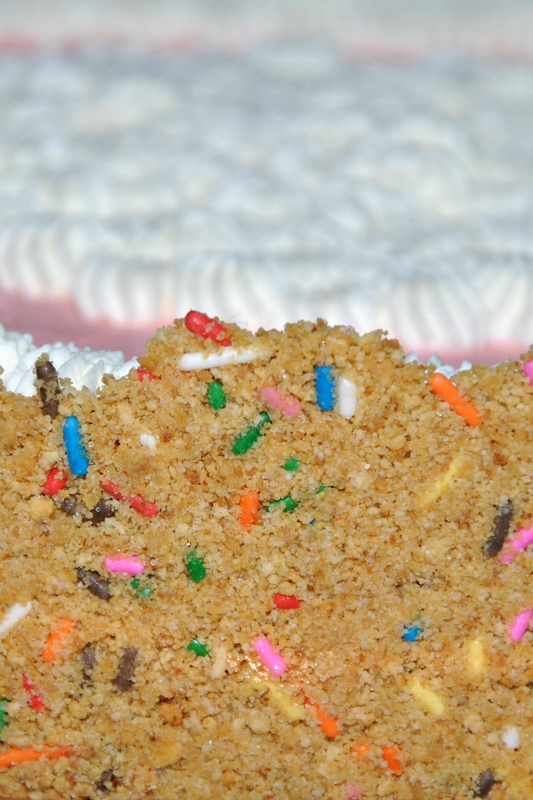 I love this cheesecake recipe because it makes me feel like a kid with the sprinkles and strawberry milk. 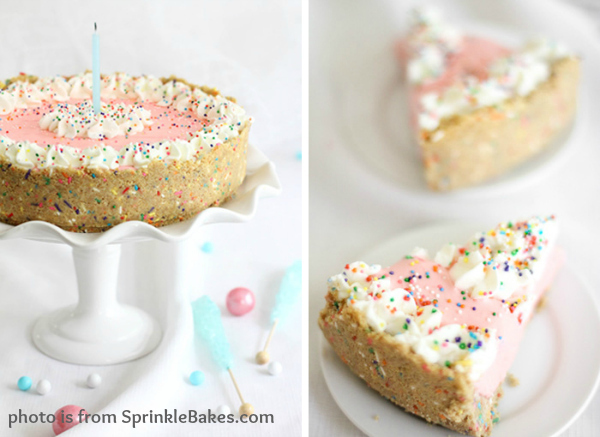 I hope you guys love this No Bake Strawberry Milk Cheesecake as much as I did. Thank you SprinkleBakes.com for the recipe! OMG this looks amazing, Tiffany! Oh my yummmmm!! That looks so amazing!! I definitely need to try this. . .thanks for sharing! So fun, especially for a birthday!